We occasionally run special "package" stories in our paper. These packages feature many stories on the same theme that run in a single day's paper, or they may be a series of stories that run over many days, weeks or months. On this page are links to those special packages, plus links to issues of greater public interest. The 2008 Olympics take place in Beijing, China where the world's top athletes will compete to bring home medals. The rise, fall and memories of Hawaii's pan-Pacific airline. to New Orleans to face Georgia. A guide for Hawaii's senior citizens. A look at 10 communities, scattered across the island, and the change each is experiencing. A guide to the University of Hawaii Warriors football team. A guide to the University of Hawaii Wahine volleyball team. Hitting the big 5-0? Hit the road again. Outrigger bets on renewal in the heart of Waikiki. Star-Bulletin marks 5 years since sale. 43 Days: Downpours. Death. Destruction. Art Todd, the banjo playing singer, is 92 years old and still going strong. A comprehensive report on Hawaii's housing market. Hawaiian folklore and stories, courtesy of Kamehameha Schools. to the bustle of Chinatown. and type in (Hawaii Diet) with the parentheses. That will bring up a long list of past Star-Bulletin articles on the subject, including recipes. Star-Bulletin reporter Catherine Kekoa Enomoto and photographer Ken Ige were afforded a rare invitation to visit the "Forbidden Island"
Has Gov. Cayetano kept campaign promises? Compiled by the POP Accountability Group. Burl Burlingame writes a series of articles on places and pieces of Our Hawaii called "Wat Dat?" This is a collection of Wat Dat columns that ran in the dark days before the start of starbulletin.com. The complete text of the Liggett & Myers agreement. to talk about the issues and political process. slide toward secrecy in its dealings with the public. This series focuses on the past, present and future of Kaimuki's business district. Our long-running program with Waianae High School to improve the lot of students relegated to the "portable" classroom. 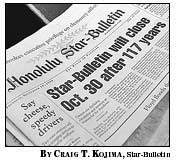 Our page of links to Star-Bulletin articles on the subject, as well as columns, opinion and letters to the editor. 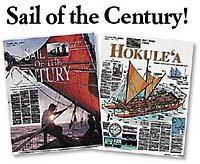 by Honolulu Star-Bulletin. All rights reserved.